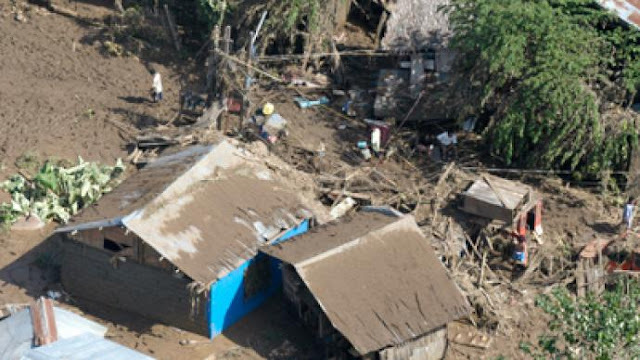 A landslide has killed 26 people with many more missing after tropical storm Kai-Tak ripped into the Philippines today. Heavy rains from the tropical storm triggered landslides in the central Philippines according to media reports. More than 35,000 families or almost 160,000 people in Eastern Visayas and Caraga region have been affected by Tropical Storm Kai-Tak or Urduja to the locals, the National Disaster Risk Reduction and Management Council (NDRRMC) reported Saturday. The NDRRMC's situational report released around 8 a.m., said the affected population is composed of 35,021 families or 158,166 people in 322 barangays across the two regions. Of this number, 8,831 families or 38,846 people are staying in evacuation centres. The storm has also cut power supplies to thousands of people as it heads west towards Palawan. Many areas were flooded, damaging crops and infrastructure. Kai-Tak has weakened to a tropical depression after barrelling through the eastern region of Visayas on Saturday, hitting islands and coastal towns such as Tacloban City where super typhoon Haiyan claimed 8,000 lives in 2013. Locally known as Urduja, Kai-Tak was packing winds of 55 kilometres (31 miles) per hour with gusts of up to 80 km/h, according to a weather bureau bulletin.